I was so excited when I was approached by Dermacare Direct to review one of their new products on their website. 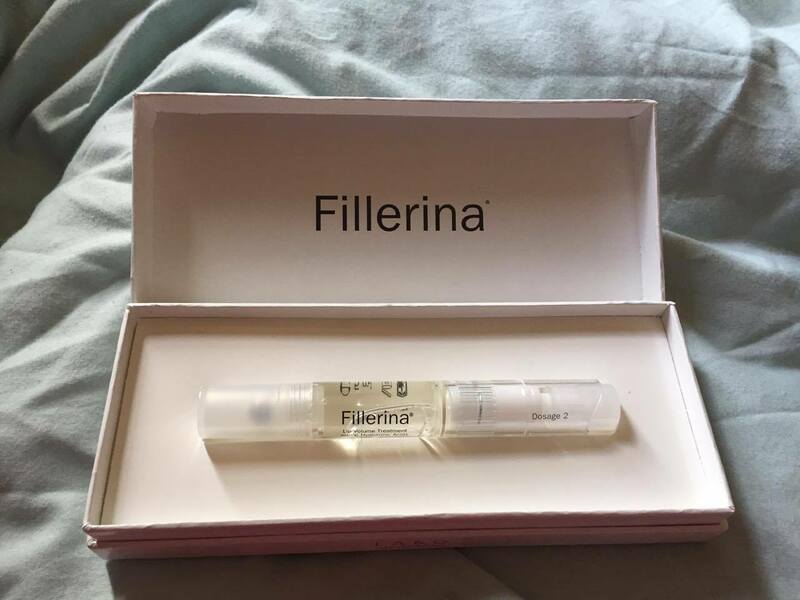 I was torn between their brow & lash accelerator and their lip plumping product and ultimately the thought of having lips to rival those of the Kardashians pulled me towards trying the Fillerina Lip Volume. Firstly, I was very impressed with the results and before I scare you off thinking it had me injecting my lips daily, it's safe and non-invasive - so keep reading to find out more about the product if you'd like to get your hands on one. The Fillerina Lip Volume consists of an applicator filled with 6 penetrating hyaluronic acids which are applied to the lips through a metal roll-on applicator. A single session of hyaluronic acid injections start from about £300 and have to be repeated often, so at £47.50 this product is both cost effective and easy to use. The product has a plunger on one end which you press gently 3 times to push the product up to the roll-on applicator. You then apply the liquid to your lips 5 times a day onto clean lips and avoid putting any lip product on top for about 5-10 minutes. The product comes in two dosages depending the results you are after, I received Dosage 2 which I assume had a slightly stronger effect. Not only is the product designed to make your lips look more plump but also make them more defined and "younger looking". My lips have never been thin per say, but I've never had much of a top lip. The photo above was taken two weeks after using the Fillerina Lip Volume - sadly I forgot to take a photo prior to the treatment but I definitely noticed they were more "plump" and my top lip didn't disappear when I smiled. After seeing my results, my mum's debating buying one for herself as she keeps insisting her lips are like two lines. The product itself was very easy to use, glides on the lips easily and gives a cooling sensation - it's completely pain free although it can dry your lips a bit so It's important to stay hydrated and apply vaseline or chapstick throughout the day. The price may seem a bit steep compared to lip plumpers you see in drug stores, but the results are long lasting and one 5ml applicator has lasted me over a month. Here's a photo of my results after 3 weeks of use - sorry for the awkward lip pose but it's not easy to take a close up photo of your lips without looking a bit weird. You can buy the lip plumper for £47.50 - if you do try it make sure to leave me your thoughts in the comments! oh that looks really good. I have tried the Fillerina night cream and that was great too, you could really see it working overnight. It's such an unassuming looking brand with their very minimalist packaging that it kind of takes you by surprise that it works so well.